As a film critic there is a subconscious expectation that comes with how a film studio screens its movies. We all know (or should know) by now that when they wait until the night before or just forego invitations altogether that even they know they have something unspeakable on the horizon. By average, even critics in the big cities are aware that a Monday or Tuesday screening of an opener that week is a toss-up proposition, especially on a major release that is "critic-proof" and yet screened as professional courtesy. We still can't figure out what Paramount was thinking with how they screened Noah. But the earlier a studio screens a film for the press, the happier they are with it and feel confident enough in getting the perceived curmudgeons to start talking it up early. Even if they continue to embargo our reviews as long as possible. But it also gives that studio time to get real professional writers to tout their movie. They might even be able to get something interesting to put on an ad or in a commercial. So the question this week is who at Summit traded away all their best draft picks to end up with those who are well past the concussion limit? See what I mean? Here's a guy who has been a five-time member of Criticwatch's yearly Top Ten Quote Whore list. See why? How are you going to take such a person's recommendation seriously? Russell's reputation as a punster is well-documented, but even if you ignore the name under the quote, it is the quote itself that is groan-worthy enough to make someone believe that it was spoken by someone less-than-credible. Putting Jay Crawford of ESPN Sportscenter on the ads calling Draft Day "incredibly realistic" makes at least a bit of sense. It promotes authenticity from someone close to the action even if he's not a film critic persay. There is nothing authentic about Greg Russell or the quote he likely chose from the Summit marketing plan. Those are four more slaphappy junket whores for you. Joel Amos was the 2012 Whore of the Year. Jim Ferguson won Criticwatch's Bag O'Douche Award one year for backing off his praise of Warner Bros.' Yogi Bear. Nancy Jay nearly made the Top Ten last year with eight quotes for morning show Daybreak USA. Then you have four-time Whore of the Year winner, Shawn Edwards, whom you can read all about and more here. But the dumbest and most excruciating bit of whoring has yet to be unveiled. Pete. Hammond. Just the name causes the kind of nervous twitches that would kill Inspector Dreyfus. Deadline Hollywood's own, the former "film critic" of Maxim Magazine, really believes he commands a level of respectability in this industry when really he is just a punchline. Idiotic thoughts and such obvious studio shilling at every level, that when Hammond becomes the slam-dunk trump card "look who is saying our best great thing" on an ad, bulimics relapse across the world. Kevin Costner is in the midst of an all-out return to movies with major supporting turns in Man of Steel and Jack Ryan: Shadow Recruit and starring roles in 3 Days to Kill and now, Draft Day. He could use a solid hit amongst adults (then again, so could Summit.) Let's not suggest that Man of Steel's success was attributed to Costner (or that it was good) but do remember the days of the late '80s and early '90s when he was making great films (and even some lesser one that were still big hits.) We like Kevin Costner and it would be nice to see him return "to glory in the kind of role that made him a star" as Hammond says in his quote. And many times before. 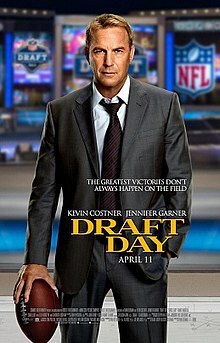 Which puts Draft Day roughly on par with The Guardian; a comparison even Ashton Kutcher would say "no, Kevin, ixnay." Then apparently everyone forgot again when Mr. Brooks and Swing Vote came out. Clearly Hammond is not exactly selective in making former associations. But they are ones we would hope bring us back to those days of the late '80s and not the late half of last decade. ""Every bit as good as Bull Durham and Field of Dreams," huh? At least give Hammond some credit for reaching back into the archives and not just picking out the most recent comparison in the marketplace as some critics are trying to say about this week's God-awful horror flick, Oculus. ("The scariest film since The Conjuring.") But The Godfather is to American Gangster as Field of Dreams is to Draft Day. Incomparable. Not that it's going to stop Hammond from trying. When was the last time you thought about Bottle Shock? Raise your hand if you even know what it is. And given War, Inc.'s 30% rating on Rotten Tomatoes it is unlikely anyone is putting it in the same sentence as Dr. Strangelove other than Pete Hammond. We'll make sure not to give the guy too much credit for his sense(less) memory either. Remember this gem? That is Pete Hammond in a nutsack as they would say on Veep. And lazy studio marketing as well. Three months of screenings to put together a campaign compiled with real film critics and Summit went right back to junket pile. When we look at Draft Day (currently at a decidedly mixed 55% on Rotten Tomatoes) is Hammond saying that it succeeds to the same sort of heights as two of the best sports movies ever or that Bull Durham and Field of Dreams were never as good as their reputation and Draft Day is at least as decent? He's not quite like his fellow Pete (the Travers) who will insert graphic hyperbole into 2.5 & 3-star film reviews to make sure Rolling Stone gets their free ad placement. No, Hammond inserts his graphic hyperbole into everything. And is not afraid to pun-it-up every once in a while either. Every bit as ridiculous as his Draft Day quote.